The Hawaii Department of Education (HIDOE) in collaboration with Western Association of Schools and Colleges (WASC) began a five-year plan to accredit all public elementary schools here in the islands. This accreditation process focuses on student achievement and a culture of continuous improvement at the school site. Kapolei Elementary School completed the requirements for the Western Association of Schools and Colleges (WASC) self study report. A team of four members visited our school site to validate all the great things students are learning at KES. 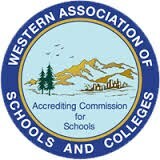 Upon the recommendation of the WASC visiting committee, Kapolei Elementary School will await the final status that will be determined by the Accrediting Commission. As a school, we will continue to strive for excellence in supporting the achievement of all students. Thank you to our administrators, faculty & staff, parents, students, and the community for your support of KES. We are very proud of our school!